Bharti Airtel has partnered with Microsoft to deliver cost effective cloud based Office 365 to Small and Medium Businesses (SMB) in India. The telecom services provider will use its own cloud platform and give SMB’s access to Office 365 via its DSL and Internet Leased Ports (ILP) infrastructure. By this collaboration, Airtel and Microsoft aim to deliver affordably priced IT solutions to SMB in India. Business owners will have access to a range of Software-as-a-Service (SaaS) and IT solutions depending on their own requirements at a monthly cost. 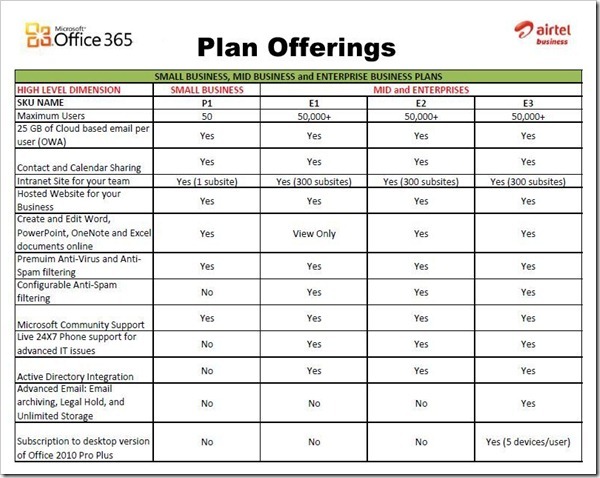 Putting jargon into perspective, Office 365 is a subscription service which users can access from anywhere. From Office applications like Microsoft Word, PowerPoint and Excel to anti-virus, e-mail, contacts and calendars, subscribers can use a host of software services without having to worry about installing the same on their computers. Users can store and access their files, directories, contacts, websites and much more from anywhere and from any machine as long as they have a supportive internet connection. By partnering with Microsoft, Bharti Airtel eyes giving near turnkey solutions to the basic software needs for SMBs. For freelancers and home office owners, Airtel’s plan includes a 2 MBPS DSL connection, cloud based e-mail, hosted website, team file sharing, anti-virus and 24/7 availability of customer support on phone. This is in addition to the web-based use of Word, PowerPoint, Excel and OneNote files. In a nutshell, a subscription will potentially allow a home based office owner to go live without having to worry about installing different software and setting up connectivity. Plans for small businesses and bigger setups have additional features including Active Directory Synchronization, CEO and Sales Support productivity pack, enterprise content management, customized customer relationship management and those that deal with regulatory and compliance requirements. In a multi-user environment, top level users will be able to set inbox rules, delegate user access, create archives and place legal holds on emails. DSL connectivity speeds of up to 4 MBPS are offered. For small to medium businesses, this presents to be a stepping stone to move towards cloud based services. For example, a small business owner will no longer need to fret about setting up the architecture and infrastructure to support multiple users with basic computing needs that revolve around Microsoft docs, email, phone and connectivity. "The partnership will allow us to become a virtual CIO for our SMB customers…With our superior network experience and Microsoft’s dependable technology suite we will be able to offer cost effective and secure cloud services in a high growth SaaS market." said Sanjay Kapoor, CEO, Bharti Airtel. Indians are no strangers to cloud platforms and related services. Google Apps is a well known SaaS delivery platform which gives Google users access to e-mail, calendar, docs, team sites, archiving facilities and 24/7 customer support. The service is free for individual and small teams of up to 10 members. For businesses, Google Apps can be subscribed to, for $5 a month per user or $50 per year per user.